garlic, oregano and other spices, plus tomato. Photo by Claire Freierman | THE NIBBLE. If your experience with feta cheese is limited to Greek salads or a pita pocket, branch out: There are many ways to enjoy this tangy cheese. As we were looking at recipes* on the website of Nikos brand feta, we were inspired by the suggested wine pairings. *Feta and Roasted Eggplant Terrine, Feta Cheese Beggars Pouches, Feta Cheese with White Bean Hummus and more. Feta is Greece’s most famous cheese: a pure white, aged curd cheese that crumbles easily. While the cheese has been made since antiquity, the name came into the Greek language in the 17th century, from the Italian word fetta, meaning slice. The name refers to slicing the cheese from the brick. Authentic feta is a sheep’s milk cheese, or a mixture of sheep’s and goat’s milks. Outside of the EU, where the recipe is protected by law, it can also be made of cow’s milk. 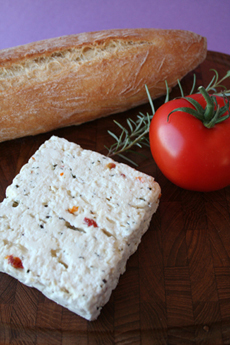 Feta is formed into bricks and salted and cured for several months in a brine solution. The cheese is semi-hard, with a flavor that can range from mild and milky to salty with a very tangy acidity. Watch out: cheaper brands of feta can be inedibly salty. If you purchase a brand that turns out to be too salty, soaked the cheese in water or milk to remove some of the saltiness. Visit the Nikos website by April 30, 2011 for a chance to win a Mediterranean cruise.